Sugar & Everything Nice: Sweet Potato Cake - Celebrate with Cake Slice Bakers! 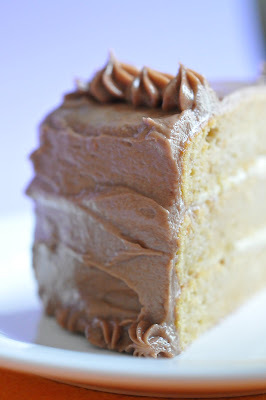 Sweet Potato Cake - Celebrate with Cake Slice Bakers! 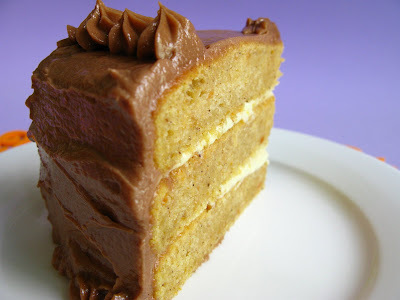 Sweet Potato Cake - this is the choice and flavour for November's Cake Slice Bakers challenge! Maybe it's timely as this cake seems to blend in well with the holiday celebrations of Halloween and Thanksgiving. In fact I was one of those who voted to bake this cake for November (along with the majority of the group). 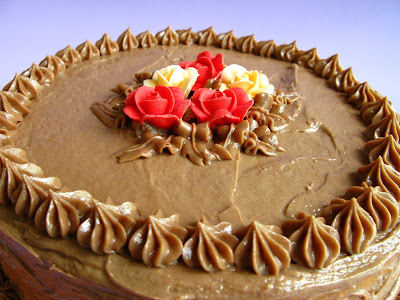 To me the flavours of the cake seem intriguing - sweet potato, chocolate and orange cheese frosting! Sounds yummy! I had wanted to start early this month and get all my challenges out of the way. Unfortunately I was down with a flu the 1st week-end of November, probably from a flu bug that has been going around in the office. A number of my colleagues seemed to have caught it as well. Thus I had to wait another week. I had only 2 weekends left before actual posting, coupled with a Daring Baker's challenge to complete sort of stressed me out somewhat! At times like this I always wonder why did I get myself into such situations. But then if I had not joined these two amazing groups, I would not even have attempted 90% of their challenges. So you could say I have learned heaps! 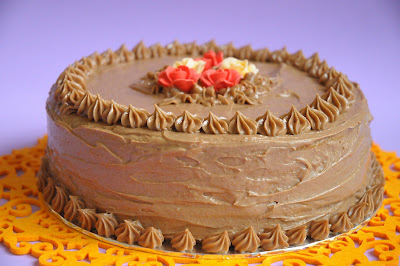 I don't know what it is but every time I have to do a cake frosting, that very same day seems to be a hot and humid one! Sunday was no different. It had rained the day before, in fact practically the whole day. So I thought Sunday would be cool but it seems someone of higher authority decided "today we shall have sun". And so it was! Couple of things went wrong with this challenge. Firstly I whipped the egg whites first and set it aside. I then tackled the rest of the instructions. The last part called for stirring in 1/4 of the whipped egg whites into the batter, which I did! Immediately after doing so, I realized my egg whites had started to turn watery! I wasn't sure what would happen if I poured the rest of it into the cake batter but I wasn't going to take the chance. The thought of a deflated cake came to mind and I was not about to start from sractch again. I immediately whipped up more egg whites. Luckily the cakes turned out great, whew! However I couldn't say the same when it came to the frosting. As I had mentioned it was a hot, hot day. Heat and frosting are certainly no pals - they can't even sit in the same room together without bickering. I had to put the cake into the fridge at least three times before I could finally finish the decoration. It was not much point trying to smoothen the sides so I left the cake with a "rough unfinished" look. In a couple of my previous posts I had mentioned that my dear husband simply does not eat cake. I gave him an itty bitty piece of sweet potato cake to try and he had such an expression on his face ...... it was close to giving a child bitter medicine. I give up! Instead most of the cake went to my office colleagues the next day. Everyone loved it. When I asked my boss to guess what type of cake it was, her immediate response was carrot cake. I told her otherwise and she said that she wouldn't have even thought of sweet potato. This cake taste exactly like a carrot cake and I personally think it was even better the next day. However I did think that the frosting was a tad too sweet. A tip from a fellow Cake Slice member is to add a pinch of salt to the frosting to tone down on the sweetness ... how clever - I certainly never thought of this. 1) Preheat the oven to 400F degrees. Prick the sweet potatoes in 2-3 places, place on a small baking dish and bake for 1 hour or until the potatoes are very soft. Remove from the oven and cool slightly. 2) Reduce the oven temperature to 350F degrees. Butter the bottoms and the sides of the pans and line with parchment paper. Butter the parchment paper also. 3) When the sweet potatoes are cool peel off the skin and remove any dark spots. Cut the potatoes into chunks and puree in a food processors. Puree until smooth. Measure out one cup of potato puree and set aside. 4) Sift the flour, baking powder, cinnamon, nutmeg, and ground cloves. Set aside. 5) In the bowl of electric mixer add the egg whites and attach whip attachment. Beat on medium speed until egg whites are frothy. raise the speed to high and gradually beat in 1/4 cup of sugar. Continue to beat until the egg whites are moderately stiff. 6) In another large bowl with the paddle attachment, combine the sweet potato, butter, vanilla, and remaining sugar. Beat until light and fluffy. Add the egg yolks one at a time. Make sure to scrape the sides of the bowl after each egg yolk is added. With the mixer on low speed, add the dry ingredients and milk in alternately in 2-3 additions. making sure to begin and end with the dry ingredients. 7) With a large spatula, fold in one fourth of the egg whites into the batter to lighten. Then fold in the remaining egg whites until no streaks remain. Making sure to not over mix or this will deflate the batter. Divide the batter among of the three pans. 8) Bake for 25-30 minutes or until a cake tester comes out clean. Let the cake layers cool in the pan for 10 minutes. Then turn out the cake layers onto a wire rack and cool completely at least 1 hour. 9) To assemble the cake, place one layer flat side up on to a cake stand. With a pastry bag fitted with a 1/2 inch round tip and filled with chocolate cream cheese icing, pipe border around the edge of the cake. Fill the center with the orange cream filling smoothing it to the edge of the border. Place the second layer on top and repeat the process. 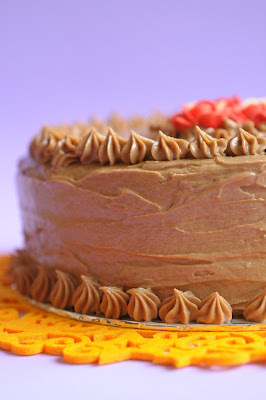 Place the third layer on top and use all the chocolate cream cheese frosting to cover the top and sides of the cake. 1) In a large mixing bowl, beat together the cream cheese and butter until fluffy. Slowly add the powdered sugar to cream cheese butter mixture. Making sure to scrape down the sides the sides of the bowl. Then beat until light fluffy 2-3 minutes. 2) Measure out 1 cup of frosting and set aside.3. Add the melted chocolate to the remaining icing in the bowl and beat until well combined. Stir together all the ingredients until well mixed. Gorgeous, gorgeous cake!! I love the decorations and piping - stunning. Well done. First of all, I love the beautiful piped roses. Second, I'll take your husband's slice of cake next time. Whoaaaww that looks great... Perfect cake and nicely decked up too... I would like to subscribe to your posts can you pls add the subscribe via reader, so I can subscribe and get your posts first hand. Looks fabulous! How can your husband not like cake??!! That's craziness. I'll have his share. Your cake looks wonderful. I love how you piped the dots around the edge, it really finishes it off. AAHH!!! Your cake looks so nice and moist. Great looking decs too. Nice job. You did a fantastic job decorating this cake! Beautiful!! It looks scrumptious! You did a fantastic job of decorating. I certainly can't tell you had any problems with the frosting. It looks superb!! Even though the weather was against you, you did a wonderful job on your cake - it is beautiful. I tend to like it better the next day too. Your cake looks great; love the piping and then loved it even more when I saw the flowers on top! I would have never thought from looking at it that you ran into problems! It looks wonderful! oh gosh.. i have a boyfriend just like your husband too. It's so difficult to make them eat sweet stuff. *groanz*. lucky colleagues of yours then! Hi all, many thanks for dropping by and I did love baking this cake, though I'd decrease the sugar content the next time round. 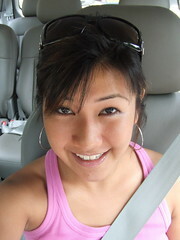 Hi Ramya, I check out how to add the subscribe. Hi Shibani, will check out your blog on details of the bread baking event. Thanks. beautiful cake! i love the flowers on top as well. again beautiful cake. I love how your decorated the cakes...looks absolutely perfect!